The Anabaptist ancestors of the Low German speaking Mennonites in Latin America migrated primarily from the Low Countries in Europe to the free city of Danzig (in what is now Poland) to avoid persecution. It was here that the distinct religious and cultural identity of this Mennonite group was formed. In the 18th century, Prussia began imposing restrictions on Mennonites living in the Danzig area because of their unwillingness to participate in military life. In order to maintain their distinctive religious identity in the face of this threat, many Mennonites migrated to Russia. The Russian empress, Catherine the Great, wished to populate Russia’s newly acquired territory, Ukraine, and sought settlers to this end. Mennonites were one group among many from across western Europe to take up her offer. Beginning in the late 18th century, approximately 8,000 Mennonites moved to Ukraine. Determined to ensure their distinctive life, Mennonites negotiated military exemption, the right to continue their settlement patterns, and the right to educate their children in keeping with their culture and religion. In the mid-nineteenth century, Russia embarked on an assimilation program of its various immigrant populations. For Mennonites, the most immediate threat lay in Russia’s implementation of a universal conscription law in 1870. Once again intent on preserving their distinctive identity, 18,000 Mennonites left Russia beginning in 1874, 10,000 to the American prairies and 8,000 to Manitoba. Those immigrating to Manitoba negotiated an agreement with the Dominion government which granted them military exemption, allowed them the right to maintain control over their children’s education, and allowed them to settle in their familiar patterns of village and colony. 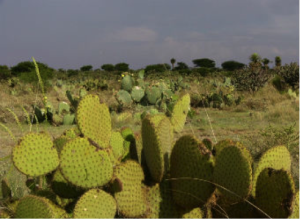 The move to Mexico meant adapting to a new climate and new agricultural techniques. From 1922-27, approximately 7,000 Mennonites moved from Manitoba and Saskatchewan to northern Mexico. (Another 1,800 moved to Paraguay.) In Mexico, Mennonites established four colonies in order to maintain their separate and distinct lifestyle. Manitoba Plan, Swift Plan, and Santa Rita are clustered around the Mexican city of Cuauhtémoc in Chihuahua and Hague (now commonly called Durango) is located further south in the state of Durango. 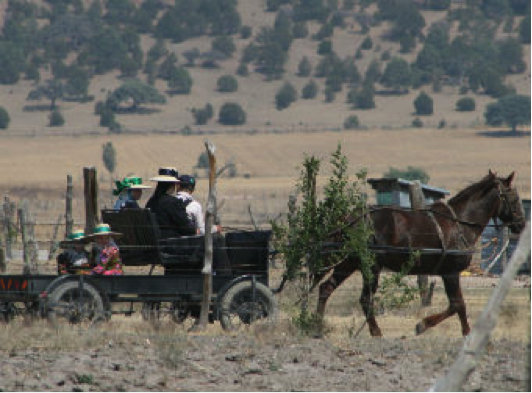 In spite of the difficulties Mennonites encountered when they first settled in Mexico, such as having to learn new agricultural techniques better suited to northern Mexico’s desert climate, they eventually established themselves. The Mennonites’ commitment to an agrarian lifestyle ensured that land shortages had become a serious issue by the 1950s. Sharp differences also developed among the Mennonites as to what it meant to be separate and distinct. Some were convinced that the only way to survive would be to adopt modern technology to make agriculture more viable. Others were equally firmly committed to a belief that such accommodation undermined the very reason for their existence, that is, to be separate from the world. How to remain separate from the world is an ongoing question for many Mennonite groups, not just those in Latin America. In 1958, some of these Mennonites established colonies in British Honduras (now Belize) intent on retaining their anti-modern lifestyle. Another 3 colonies were established in Bolivia in 1967/8 for much the same reason. Daughter colonies were also established in various parts of Mexico under less fractious circumstances in an effort to address the land shortage. Colonies have continued to multiply in Latin America. Some are established to address the never ending issue of land shortage. Others begin, like they did in Belize and Bolivia, because the tension of accommodating or not accommodating modernity is always an issue for Mennonites who wish to remain separate from the world. Since first migrating to Latin America in the 1920s, migration has been an ongoing reality for many of the Low German Mennonites. Additional colonies have been established throughout Mexico, Belize, Bolivia, Paraguay, and Argentina. By 2010, the adult population of Mennonite descendants of the original 1920s immigrants to Mexico and Paraguay was approximately 52,000. For some Mennonites who migrated from the prairies to Mexico in the early 20th century, the connection to Canada remained strong. Following the initial migration to Mexico in the 1920s, there was a steady trickle of Mennonites who returned to Manitoba and Saskatchewan. However, following a drought in Mexico in the early 1950s, the ready cash available in seasonal agricultural work attracted Mennonites to Ontario. The first Mennonite family to arrive in Ontario from Mexico came in 1952 and stayed near Kitchener. After a summer spent working in the agricultural sector, they returned to Mexico. View Map: Main communities where Low German families have settled in Southwestern Ontario. It is difficult to pinpoint exactly how Mennonites in Mexico first heard about the possibilities of work in southern Ontario. Perhaps they heard through their relatives in Manitoba who were also taking advantage of the opportunities of seasonal work in Ontario. In Mexico, word quickly spread that working in Ontario was lucrative and families began arriving. Most worked on tobacco, tomato, and cucumber fields. Early Mennonite immigrants to Ontario worked mainly in Haldimand-Norfolk County, Essex County, and Chatham-Kent. Initially Low German speaking Mennonites came to Ontario as migrant workers, but there were enough that settled permanently or semi-permanently so that by the early 1960s Mennonites from Mexico had organized several churches in Ontario, including an Old Colony Church. The first generation of Mennonites to come to Ontario from Mexico had little difficulty entering Canada. However, immigration requirements have tightened considerably since then but the flow of Mennonites from Latin America has not stopped. They continue to come to Ontario primarily for economic reasons, most often finding work in the agricultural sector. Some settle here permanently, others continue the pattern of an earlier generation and return to their homes in Mexico every winter. How many Mennonites from Latin America are in Ontario? There are currently approximately 10,000 Mennonites from Mexico and Latin America in southern Ontario. There are other sizeable communities of Mennonites from Latin America in Texas, Kansas, Manitoba and Alberta. They come primarily from the Mennonite colonies in northern Mexico but they are also come from colonies in Durango and Zacatecas. Others come from Bolivia, Paraguay and Belize.